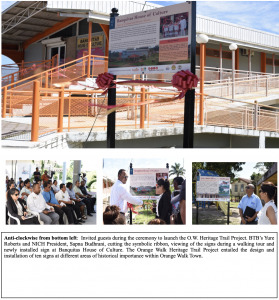 Belize City, Thursday, January 24th, 2019: As part of its ongoing efforts to develop destinations and promote the attractions and historical areas of the various tourism regions of Belize, on Wednesday, 23rd January, the BTB joined key industry stakeholders in launching the Orange Walk Heritage Trail Project during a brief ceremony at the Banquitas House of Culture in Orange Walk Town. The Orange Walk Heritage Trail Project entailed the design and installation of signs at different areas of historical importance within Orange Walk Town. These include Central Park, Fort Mundy, Fort Cairns, St. Peter’s Anglican Church, School and Piedmonte Cemetery, La Immaculada Church and School, Main Street, the Barracks and Riverside, Old Hospital (Sandy Hunter Library), the Old Power Plant (Fire Station) and the Banquitas House of Culture area. The project was implemented by the BTB in collaboration with the National Institute of Culture and History (NICH), the Institute for Social and Cultural Research (ISCR), the Orange Walk Town Council, the Ministry of Tourism and the Banquitas House of Culture. The northern region of Belize, which includes the towns of Corozal and Orange Walk offer some of the most beautiful scenery and historical areas. Orange Walk Town alone is the home of a large Mestizo population with a rich culture and folklore, excellent cuisine, in addition to the delicious tacos, and important historical sites. The BTB is committed to fostering the sustainable growth of our dynamic tourism product for the enjoyment of both visitors and Belizeans and we encourage tour operators and tour guides to utilize this new tourism product.